In the years after World War II, an intense rivalry developed between the United States and the Soviet Union. Both countries had atomic and then thermonuclear weapons, and aircraft that could deliver these bombs to distant targets. Some American families purchased or built underground shelters to protect them in case of Soviet attack. This same era also brought unprecedented international cooperation in the sciences. The time from July 1957 through December 1958, a period of high solar activity, was designated the International Geophysical Year. During these months, scientists from throughout the world carried out new observations of the earth and its atmosphere. 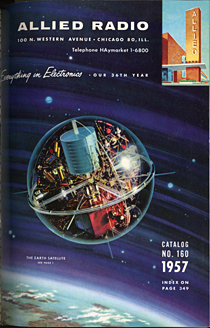 As part of this program, the United States planned to launch the Vanguard satellite in 1958. Well before this happened, the Soviet Union sent up Sputnik. In the early 1950s, both the United States and the Soviet Union carried out thermonuclear tests and then developed deliverable hydrogen bombs. They worked to build missiles that could deliver these weapons over long distances. This circular slide rule made it possible to calculate some of the devastating effects of such a blast. As the earth moves, the gravitational forces of the moon and the sun cause changes in the ocean levels (tides) as well as small motions of the earth (earth tides). One goal of the International Geophysical Year was to carry out worldwide measurements of earth tides. These observations were made at about a dozen sites around the world, all of them located in nations allied with the United States. 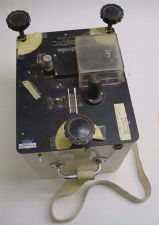 This is one of two instruments used for the work. It could detect changes in gravity of one part in a billion or less. 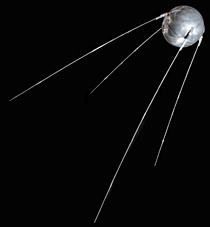 The outside of the 184-pound (83.5 kilogram) Sputnik satellite was a sphere 23 inches (58 centimeters) across, made from a highly polished aluminum alloy. Four antennae projected from it. The satellite transmitted radio waves at two frequencies. This model is on exhibit at the National Air and Space Museum. 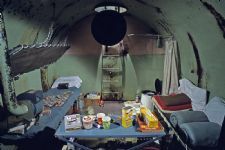 To survive a nuclear holocaust, some Americans families built or purchased and equipped underground living quarters known as fallout shelters. This example was buried in 1955 in the front yard of a home in Indiana. It was a free-standing steel drum, laid on its side and equipped with a covered escape hatch that rose above ground level. The owners stocked the shelter with food, utensils, sleeping bags, games, and other supplies. Both the United States and the Soviet Union announced that they planned to launch earth satellites during the IGY. The Soviets hoped to demonstrate the power of their new intercontinental ballistic missiles. The United States sought to establish the right of satellites—including spy satellites—to fly over foreign nations. Engineers in both nations relished the prospect of launching rockets into orbit. Scientists could use signals from Sputnik and other satellites to develop new methods of computing orbits. And instruments flown on early satellites helped trace the shape of the earth, measured very small meteorites, and detected cosmic rays. Such observations also revealed regions of intense radiation in the earth’s upper atmosphere.